Get Some Fun in the Water, Riding a Jet Ski along the Pacific Coast. 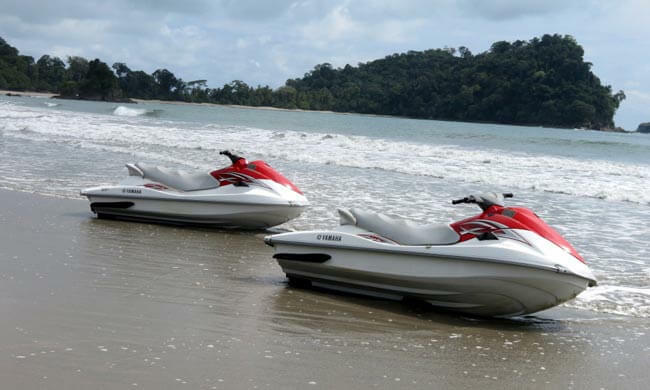 Zip around on a jet ski as you follow the Manuel Antonio coastline. Choose to pilot solo or grab a friend: the choice is yours! This is activity is perfect for water-lovers, all ages and all skill levels. Be ready when we come to pick you up! One quick ride over to the beach and a short safety lesson later, you’ll jump in the warm water and hit the waves. Go out far enough to have space to explore while still having fun. You may encounter dolphins, turtles, and whales, but be sure to keep a bit of distance so you don’t disturb them. Typically, someone from the tour is able to snap photos of you while you are out bouncing on the waves, so you’ll truly have lasting memories. This adventure on the water is by reservation only, so contact your Travel Consultant if you have any questions about the time of pick-up. After your jetskiing time is over, you can stay to enjoy the beach and return to hotel on your own later on. There will be some boogie boards for you to try out. Up to two people may ride on a single jet ski for either 30 or 60 minutes. Included: Transportation from/to your hotel, equipment, bilingual guide. Notes: minimum age 5 with an adult, 18+ ; weight limit is 250 lb. No experience needed. What to bring: Camera, sunscreen, insect repellent, change of clothes (if preferred), towel. Wear a swimsuit and sandals (or water shoes).